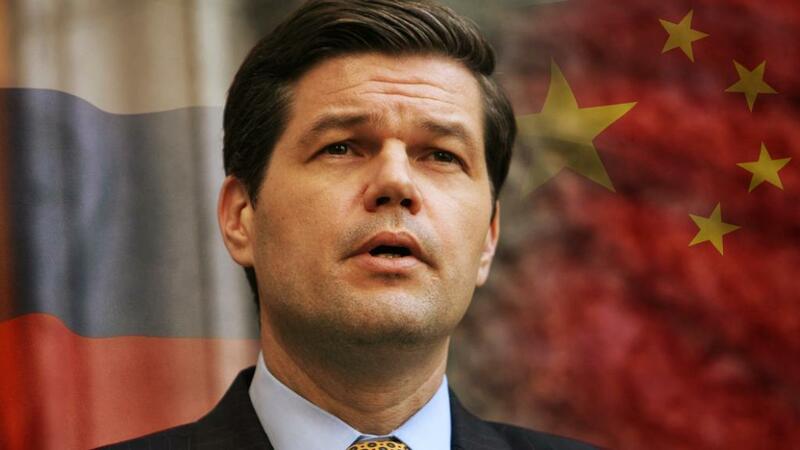 The report of Wess Mitchell, in the hall of the influential think-tank of the Heritage Foundation, outlined the main vectors of US foreign policy, appointed enemies, frightened friends and acknowledged that globalization had failed. Such speeches can not be considered simply an opinion of an influential but private person. Wess Mitchell succeeded Viktoria Nuland, who was marked by a high level of Russophobia. Mitchell is a man of the same order. For a long time he headed the analytical center specializing in Eastern Europe and Eurasia, all analytical materials of which were reduced to statements about the need to "restrain Russia" in Europe. His current speech also fits into the logic of the geopolitical confrontation between land and sea - a concept formulated by the British scientist, geopolitician, Professor of Oxford University Helford Mackinder. In his report, Wess Mitchell reminded Europeans of their current situation: "Unlike in 1919, in 1945 we did not leave Europe and created a permanent base for finding the US military, developed the Marshall Plan, organized NATO and supported the creation of the European Union". Under the "preservation of the West," Mitchell understands the persistence of Washington's rigid military and political dominance over the EU countries and recalls that "there are 35,000 US military personnel in Germany, 12,000 in Italy, 12,000 in Italy, a special relationship with Great Britain and France. One of the most important points of Mitchell's speech is the statement that Europe still has a geopolitical meaning. In other words, he acknowledged that the United States does not fully control the situation. But it turned out that the victory in the Cold War was not final, and in the next quarter of a century a critical mass of contradictions accumulated in the international arena, primarily concerning the structure of the world order - a unipolar or multipolar world. According to the analyst, in 2017, the current administration inherited a failed reset of relations with Russia, a conflict in Ukraine that had already claimed 10,000 lives, a failed Syrian policy, the largest migration wave in the history of the EU, Brexit, and an inconsistent agreement on Iran that contributed to its expansion in the Persian Gulf region and to the borders with Israel. Another rival of the United States, about the existence of which openly states a senior official of the State Department - is Russia. Most of all, Wess Mitchell is concerned about energy macroprojects that can tear Europe away from the US, primarily, the Nord Stream-2. This pipeline will make the eastern flank of NATO more vulnerable to Russian pressure, reduce the security of Ukraine as a transit state, make it more sensitive to Russian aggression, and Europe - more dependent on Russian monopolies. China is declared the main economic competitor, which seeks to squeeze the US out of all markets that it can, including in Europe. Coupled with "Russian aggression" such pressure puts the US in a quandary. Mitchell admits that the main task of the United States in the near future will be an attempt at any cost to squeeze Russia out of Europe. One of the levers of pressure on Russia will be Ukraine and Georgia, with which the current administration has significantly strengthened cooperation in the military-political sphere: "We lifted the ban on the supply of lethal weapons imposed by the previous administration and helped these countries get much-needed defensive weapons." Another important external vector of the United States will be the Eastern Mediterranean, where Washington has also lost much of its influence due to the actions of the Russian Air Force in Syria. Mitchell said that, despite the contradictions in relations with Ankara, Washington intends to continue the dialogue with Turkey. The weakening of these relations will lead to long-term losses for the national security of the United States. In the long term, Turkey is the only country in the region that can balance Iran. In other words, the US intends to use Turkey as a ram against Iran and, at the same time, continue to exert pressure. Deciphering the political terms of a senior State Department official, we can conclude that Europe must remain in the zone of influence of Washington at any cost, Turkey will also be under serious pressure for its attempts to pursue independent policy and criticizing Israel. It is possible that the next steps of Washington will lead to aggravation of the situation in Afghanistan. Together, all this suggests that the unipolar world and globalization have failed, the United States has failed to subvert and rebuild the whole world for itself. And this means that geopolitics has not disappeared anywhere, and the confrontation of the Sealand-Mainland has not disappeared anywhere. "Rimland" will again be the battlefield.